This postcard raises many questions! 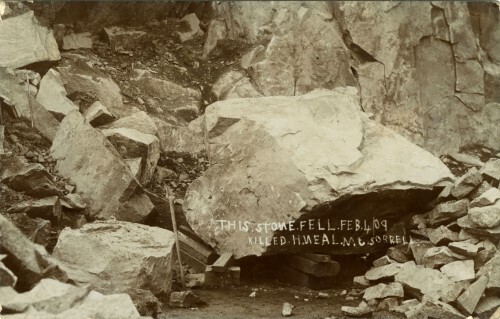 It may be asked how a Mountsorrel Quarry postcard belongs in a Quorn local history collection. Certainly these days more than 90% of the quarry is within Quorn parish boundary and in addition it has been a major employer in the area, providing employment for hundreds of Quorn men, for well over 100 years. The quarry has had a significant impact on Quorn, both economically and environmentally.